Smartphones like an iPhone 8+, X or Samsung Galaxy S8 outperform a conventional GPS in almost every way. This post has all the information you need to use your smartphone as a the best backpacking GPS, including getting up to 7+ days of battery life without recharging. Best of all, you can do this for less than $20! For starters, a large screen smartphone just plain works. We’ve taken our iPhones on numerous packrafting trips in Alaska, winter rafting down the Grand Canyon, technical Canyoneering in Utah, climbing in the Wind Rivers and the Sierras, long hikes in the U.S.A, Patagonia, Turkey, Australia, Europe, and a canoe trip down the length of the Mighty Mississippi River. We get between 5 to 10 days of average use without recharging! And Android phones like the Samsung Galaxy work well too. Incredible Map Detail and Functionality! [click to enlarge and see the full detail of this map from GAIA] Start of the John Muir Trail in Yosemite. Screenshot from GAIA with the stunningly sharp and detailed National Geographic Trails Illustrated Map of Yosemite. To clarify a common misconception: You do NOT need WiFi or Cellular connection for your smartphone GPS to work. Even in Airplane Mode, your smartphone will communicate with GPS Satellites to get your location, just the same as a conventional handheld GPS like a Garmin. That is, your smartphone has a built-in antenna and GPS chip for getting your location from GPS satellites. But for this to work with your maps (e.g. 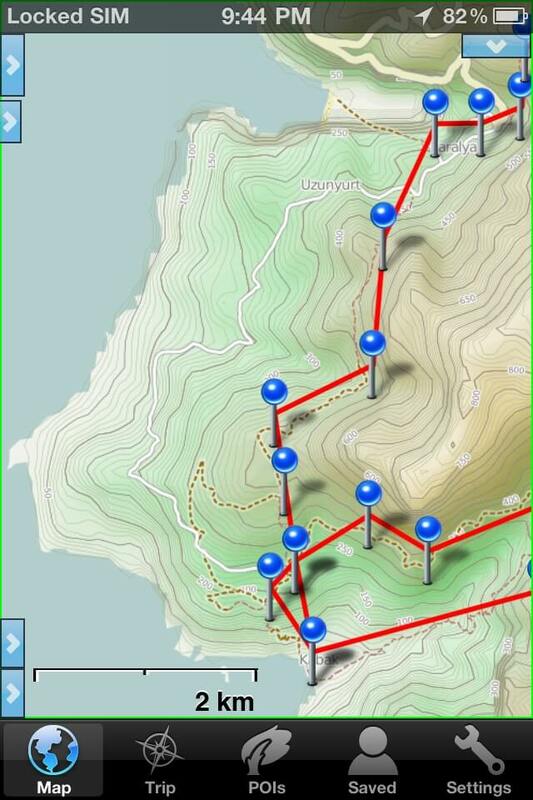 plot your location on map), you DO need to pre-download maps to your App for it to work properly in the backcountry. There are several excellent Apps like Gaia GPS that let you preload maps and GPS tracks into your smartphone before your trip. Then when you are out on the trail without WiFi or cell service, you can use the preloaded maps along with the iPhone’s GPS to do all the mapping and navigating you need. The downloaded maps are nearly free, and if you already own an iPhone, the cost of using it as a GPS/Mapping device for backpacking is very reasonable—essentially just the cost of the Mapping/GPS App. The GPS units in current smartphones are quite good and have similar accuracy to traditional GPS units like a Garmin full size GPS. The smartphone you own (free!) combined with an App like Gaia GPS (less than $20) is better and far less expensive than traditional $500-$600 backpacking GPS units like these. And since you are unlikely to leave your smartphone in the car at trailhead (that is you are already bringing it with you) the additional weight of using it as a GPS is also zero. So you just saved around 1/2 pound. Member Level lets you use the full app, and all but a few map sources. Premium Member Level gives you access to maps like like ESRI World Imagery and National Geographic Trails Illustrated Maps the most trusted and highly-rated maps available for America’s top outdoor destinations. They give you current trails, distances, and other official park info. Vs. USGS TOPO maps where this info is 50 years out of date or just missing. Free Level is in my opinion for demo only. 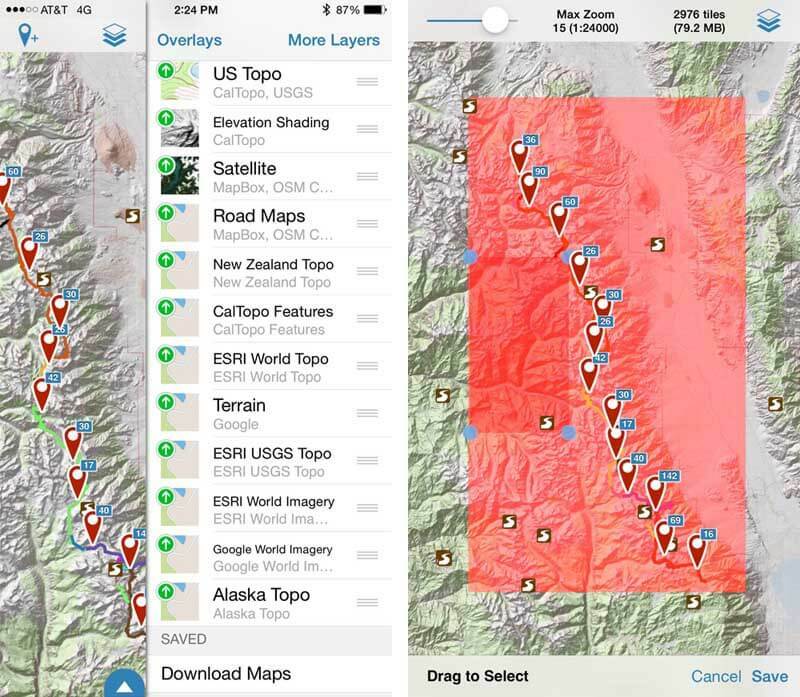 Critically, you can’t download maps for offline use—so it’s a non-starter for backcountry use. And it doesn’t have USGS Topo or OpenHikingMap HD maps. Here more on GAIA Free vs. Membership vs. Premium Membership. Expect to get between 5 to 10 days of battery life in the field without re-charging—normal daily use of the following: the iPhone’s GPS, looking at electronic maps, taking a few photos and some reading of electronic guides/references. Even so, I bring a backup battery just case I need to use the GPS more, or do something silly that drains the battery. EasyAcc 6000mAh USB Battery (pictured below) – This has slightly more capacity (tested) than the Jackery battery but has a slower charging rate and only a built micro-USB cable (altho you can attach your own lightening cable to charge an iPhone). It can charge a large phone like a Galaxy S7 about 1.4x and a smaller phone like an iPhone 7 2.3x. Anker PowerCore 10000 (only 6.4 oz) is the lightest option if you need to recharge your phone a lot. It can charge a large phone like a Galaxy S7 ~2.5x and a smaller phone like an iPhone 7 ~3.5x. The current version of Gaia GPS for Android is as good as the iOS version. As such, Android phones like Samsung Galaxy s6/s7 should provide the same excellent GPS mapping functionality as iPhones. The 5.4 oz EasyAcc 6000mAh USB Battery (left) will charge a standard smartphone two times. Battery life for Android phones: Not a show stopper, but Android phones appear to have less battery life on-trail than iPhones—more in the range of 3-5 days with moderate GPS use. This seems to be in part due to differences between Android smartphones for both a) the phone hardware and b) variations of the Android OS on installed on phones. As such, the Android environment is not as easily understood/managed vs. tightly controlled, and very predictable iPhone hardware and iOS environment. This makes Android battery management more challenging. Nonetheless, an Android smartphone is a valid & capable backpacking GPS. Do: Use your smartphone as a backpacking and hiking GPS. It’s excellent! 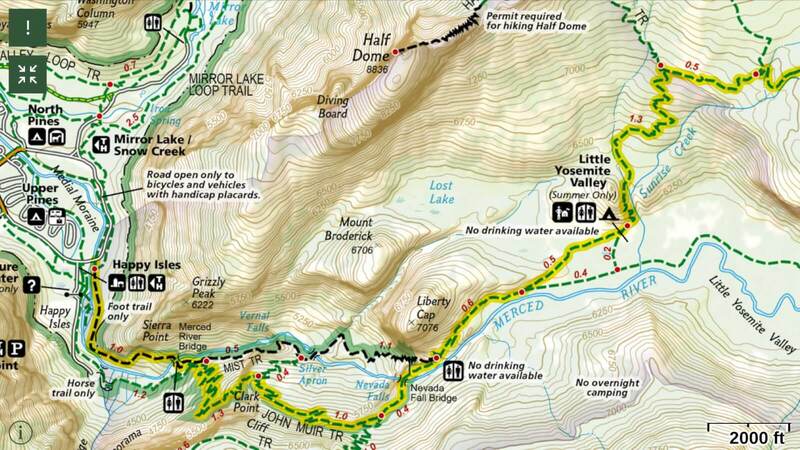 Do: Use CalTopo for your pre-trip route planning and mapping. It’s the perfect companion to Gaia GPS on your smartphone. 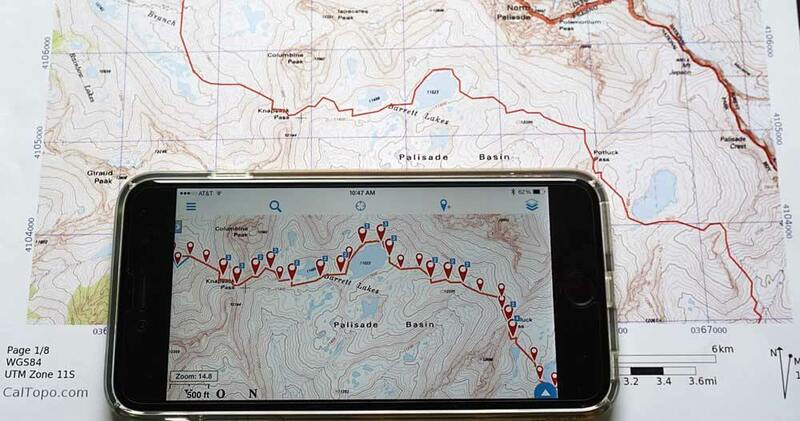 Note: If you use CalTopo for your pre-trip route planning and map printing, and GAIA GPS on your smartphone, then your printed maps will exactly match the maps and waypoints on your iPhone. That’s a big deal in the field—making everything a ton easier to follow and understand! light phone case with $0.15 Pint Ziploc Freezer Bag to protect your phone from dust, scratches and water. Do: Put your smartphone in Airplane Mode and leave it there for the duration of your trip. For iPhones the GPS will work in Airplane Mode as of iOS 8.3. Do: put your screen in auto brightness, and lower your screen brightness to the minimum amount. Screen power is the single biggest battery drain for your phone. Do: set your GPS App to only get a GPS fix when you manually request it. Good Idea: to test your personal battery use on a couple of long day hikes before taking the smartphone for navigating on a long trip. Download Maps into GAIA For Offline Use on the trail where WiFi and cellular data are not present — but where the smartphone GPS still works. On the left is a partial list map sources for download. On the right the pink box indicates the area of the map selected for Download from a Rectilinear Area. You can also use the “Download Maps for Track” feature which automatically gets all the maps needed to follow a line, a phenomenally useful feature when setting out on a thousand mile hike or paddle. Download Maps for Track and the wide range of map types are the two features that make Gaia GPS stand head and shoulders above the other available apps. Our daily use of the iPhone includes 5-50 sessions with a mapping app (depending on how ambiguous the route is), 10-20 photos, occasional use of bird guide apps, alarm clock, checking time, reading Wiki Offline, and nightly journal entries. All of our usage is discretionary excepting for the mapping apps and GPS reads. We scale our discretionary use based on how many days remain before the next recharge opportunity. With restrained use, most models of iPhones (especially the iPhone 6 Plus, 8 Plus or X) will last for a week or even ten days. If we only have two or three or four days to the next recharge opportunity, then we take more photos, play more bird calls, etc. Your mileage will depend entirely on your usage patterns. Prior to a multi-day trip, be sure to establish your baseline drain (iPhone asleep and no activity) to make sure that drain is minimized as described in the Battery Drain section. Experiment on day hikes so you can estimate your daily drain based on your own usage patterns. When all battery conservation measures are in place, the baseline battery drain (phone on, but not in use) of most iPhone models is 1-3% per day. Without proper battery conservations measures, the daily baseline drain will be at least 10% and often over 30%. By baseline drain, we mean that the phone is powered on, but asleep; it is ready for use, but the user is not actually doing anything with it. This is the background drain you will incur even if you don’t take any pictures, look at any maps, or use any apps at all. It’s important to follow these guidelines to conserve your iPhone battery and get the maximum battery life in the field. For day hikes or overnight hikes most of these suggestions are not as important, but they are critical if you want to use an smartphone for a multi-day trip without resorting to a recharge solution (external battery or solar). Our research ended up focusing a great deal on battery life, and we hope these ideas help. This is a list of major settings to increase your battery life. These settings apply to both iOS and Android. In the case of iOS I have included the menu path to change the setting. Monitor your battery charge percentage. iOS: General->Usage->Battery Percentage = ON. Minimize screen brightness and screen use. A bright screen is a significant battery drain. So to minimize battery drain you should make sure the screen is not brighter than necessary. For iOS: Wallpapers & Brightness – Auto-Brightness allows the screen to adjust its brightness based on current lighting conditions. Then still use the minimum brightness necessary to use your smartphone. For all apps still running, minimize use of Locations Services (i.e. GPS use). iOS: Privacy->Location Services = ON but Turn Location Services OFF for any app that you will be using while backpacking unless it is important for that app to have a GPS read. For example, if you use a Camera app and you want it to put a GPS stamp on each image, then leave Location Services on for that app. However, if you don’t care about having a GPS stamp on the image, then turn Location Services off for Camera app so that it does not engage the GPS (and therefore drain battery) every time you take a photo. Set your GPS mapping App to only get a GPS fix when you manually initiate it. Some apps like GAIA have excellent battery management (GPS use) settings, but some do not. I have GAIA set to only engage the GPS when I click the location icon. Keep the iPhone at a reasonable temperature. Batteries achieve optimum service life if used at 20°C (68°F) or slightly below. Avoid letting the iPhone overheat in direct sun, and keep it in pocket close to your body in cold conditions. More detailed battery information in this great article. Optionally shut down the phone at night. We never fully shut down the phone while on a trip, but if your particular phone has measurable overnight drain you could consider shutting it down every night to conserve battery. The following iOS settings should be irrelevant when Airplane Mode = ON. They are relevant only to people who choose to keep Airplane Mode OFF for some reason but want to maximize battery conservation. Use any of these as appropriate. Notification Center – turn off notifications for all apps – No sounds, no badges, no alerts, no nothing. General->Background App Refresh – You can disable each app from doing work while it’s in the background (i.e. not open and visible on the screen). Turn OFF everything that you won’t need to have running in the background while on your trip. For example, you won’t need the Stocks app trying to updated stock prices while you sleep! International mapping 1: Gaia GPS displaying OpenCycleMap of a section of the Lycian Way in Turkey. Red lines and blue pins show our intended route (2 alternatives shown). The brown dashed lines show trails that have been added by users to the OpenStreetMap database, wiki-style. OpenCycleMap and Satellite imagery are especially important when hiking in Turkey because the government does not publish any topographic maps. Using an iPhone with a $20 app (in this case Gaia GPS) we carried maps, satellite imagery, and track data for ~600 miles of trails in Turkey! National Mapping Agency maps – Topographic maps issued by the government that provide coverage for an entire country (USGS, NRCan, OS, IGN, LINZ, etc). These maps are almost always the most accurate and detailed source of topographic and geographic information, although they often do not have the most current cultural changes, such as new trails. Some governments license their map data to the apps at no charge (USA, Canada, New Zealand, and some UK maps), and others do not (UK’s best maps, France, Australia). When you use an app that gives access to freely licensed maps (for example USGS) you usually do not need to pay any fees (beyond the initial cost of the app) to download an unlimited amount of map data. When you use an app that gives access to maps for which the app developer must pay licensing fees, then you will need to pay for the map content. Prices vary wildly, depending on the fees that must be paid to the government for use of the maps. For example: iPhiGeNie charges 15 Euros per year to access the all maps that IGN publishes (not so bad); ViewRanger charges 90 GBP for the 1:50K LandRanger series, the Explorer series is additional (wow!). For access to USGS, NRCan, and LINZ (USA, Canada and New Zealand) maps we recommend Gaia GPS. Gaia GPS provides Satellite imagery and OpenCycleMaps in addition to the National Agency maps, and has a rich set of features. Plan to spend at least an hour learning how to use it, as some of the important features are not obvious. (Some day I will write a concise introduction to Gaia for backpackers, as many of the features are geared to day-hikers and should be ignored for backpacking.) For a user who wants the most complete set of functionality and the best selection of map sources, this is the best available app for the US, Canada and New Zealand. 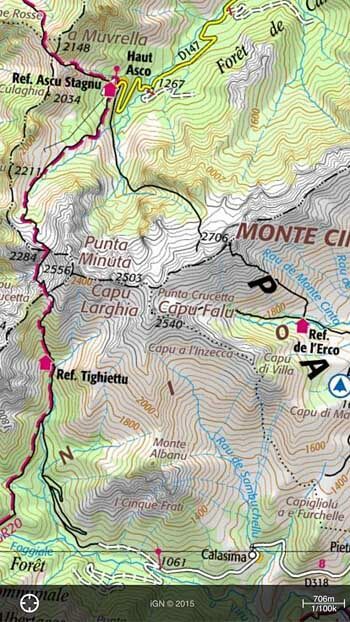 International mapping 2: A section of the GR20 in Corsica France using the iPhiGéNie App. There is no substitute for getting access to the Official National maps; they are the highest quality. For access to National Mapping Agency maps of Europe, we are not experts, but propose the following. ViewRanger is a solid full-featured app that offers the gold standard Explorer and LandRanger OS maps of the UK as well as National Agency maps for most European countries. We used ViewRanger for a long hike in Scotland and it was solid and met our needs. This app offers USGS maps as well as maps of Europe, however the usability and feature set are not as good as Gaia GPS and therefore we do not use it the US. UK Map offers freely licensed OS maps, which are not as detailed as the Explorer and LandRanger series, but will suffice for many users (especially price-sensitive users). It is elegant and easy to use, but does not support waypoints or tracks. OpenCycleMap – aka, OpenStreetMap, OSM, OSM Topo, Cloudmade Topo/Cycle, OpenHikingMap. Many iPhone apps include this map source because it is freely licensed topographic map of most of the world (below 60 degrees latitude). Although the topographic and geographic detail is not as good as maps from the national mapping agencies, there are three important characteristics: it is freely licensed; cultural information is often more current; and it covers most of world. Take a look at the OSM treatment at their website. We have successfully used OpenCycleMaps together with Satellite imagery (with no National Agency Maps) for long hikes in Turkey, Australia, and Spain. In Turkey there were no National Agency maps available; in Australia and Spain they were available but at too high a cost for our purposes. Gaia GPS is our favorite app for this map type. There are many other apps that provide access to OpenCycleMaps, but only Gaia (that we have found) also includes downloadable world-wide Satellite Imagery, is easy to use, supports waypoints and tracks, and allows import and export of gpx and/or kml files. Satellite images – Often very useful, especially for off-trail hiking. Gaia GPS is our favorite app for satellite imagery as it offers downloadable satellite imagery of the whole world (3 different sources: Mapquest, ESRI, Google). Regardless of which app you choose, there are a few considerations for using an iPhone in the backcountry. Data – When you have a WIFI connection, download the map content (and trail data if you have it) that you’ll need while hiking. Your iPhone can get GPS signal in the woods, but you will be unlikely to reach the Internet for data. Battery Life – Manage your battery life. Day hikers can get away without taking special steps to tend the battery life, but for multi-day trips, you must tend to these things. This article closes with detailed instructions on how to maximize battery life. Protect Your Phone – In terms of waterproofness and durability, the iPhone needs to be treated as you would treat a non-waterproof camera, unlike a Garmin which is designed for outdoor conditions. It can be “waterproofed” with a 5 gram $0.15 Pint Ziploc Freezer Bag , a more expensive Aloksak 4.5×7″ ziplock, or an expensive LifeProof case. Even when it not raining, we keep the iPhone in a pint zip lock to protect it from sweat and dirt. LifeProof makes low-profile light-weight completely waterproof cases, which might be an good option for very wet environments. OpenStreetMap – Spend an hour learning about OpenStreetMap (aka OSM). OSM is a free map of the world, and many iPhone apps are based on map content from OSM. OpenCycleMap (aka Cloudmade Topo) is a variation that includes contour lines and hiking trails. Data is added to OpenStreetMap by users like us, wiki style. If your favorite trails are not there, then you can add them and the world will be a better place for it. Protection for iPhone: We highly recommend using a Pint Ziploc Freezer Bag used to protect your smartphone from dust, scratches and water (effective, lighter and less expensive than elaborate waterproof cases! Works well for other electronics.). Left: the iPhone 6 in a light but protective case sitting on top of a Pint Ziploc Freezer Bag used to protect the phone from dust, scratches and water (effective, lighter and less expensive than elaborate waterproof cases!). Right: a substantial 6400 mAh external charging battery and a short lightening connector. For purposes of this article (GPS and mapping), the iOS devices vary in only two ways: GPS Chip and Battery Drain. First, some iOS devices have a GPS chip and some do not. A device with a GPS chip can identify your location (usually within 10 or 20 meters) even when it has no WIFI or Cellular signal. A device without a GPS chip can identify your approximate location only when it has a WIFI signal; these devices are still useful tools for looking at maps but will not show your location on the map while you are hiking. All iPhone models (4, 4S, 5, 5C, 5S, 6, 6+) include a GPS chip. No iPod-Touch model has a GPS chip. All iPad models that have 3G or Cellular also have GPS chip and therefore behave like an iPhone for mapping purposes. The WIFI-only iPads do not have a GPS chip and therefore behave like an iPod Touch for mapping purposes. Second, there are subtle but very important differences in battery drain between the different models and different cellular providers. See the Battery Drain and Different Models of iPhones section below for critical information. To clarify a common misconception: You do NOT need WIFI or Cellular connection for the GPS chip to work; however you do need to have pre-downloaded the map content in order to have your current location show up on a map. When all battery conservation measures are in place (as per the Battery Conservation Settings section), the baseline battery drain of most iPhone models is 1-3% per day. Without proper battery conservations measures, the daily baseline drain will be at least 10% and often over 30%. By baseline drain, we mean that the phone is powered on, but asleep; it is ready for use, but the user is not actually doing anything with it. This is the background drain you will incur even if you don’t take any pictures, look at any maps, or use any apps at all. In some configurations the amount of battery drain depends on whether you are in-range or out-of-range of the cellular provider. Therefore if you test your baseline battery drain at home you are likely to get one result (in-signal-range), while when you use the iPhone in the backcountry you may get a different result (out-of-signal-range). In order to do my battery drain testing, I constructed a Faraday Cage by putting the iPhone inside a closed cookie tin and putting the tin into a microwave oven; neither the cookie tin nor the microwave alone blocked signal. We highly recommend that you run overnight tests at home with your own phone in two test scenarios: in signal range, and in a Faraday Cage. The most important factor in preventing drain is to disable the cellular activity. The phone will incur ~10% daily drain just maintaining a signal, or 20-30% daily drain searching for a non-existant signal. Starting in iOS 8.3, you can set Airplane Mode = ON, which will disable cellular activity while leaving GPS enabled. This solves many battery management problems that previously existed. All users with an iPhone4S or later model should ensure they have iOS 8.3 (or later), and keep Airplane Mode = ON for entire duration of backpacking trips. Based on 64 overnight tests using 18 different phones, we (authors with help from many other people) offer the following guidance about baseline battery drain, assuming iOS8.3 and Airplane Mode = ON. iPhone 6 and 6-plus: We tested nine different 6/6+ phones (a variety of models and a number of carriers). All except one phone (noted below) had 10-12 hour drain of 0 or 1%, implying a daily drain implying a daily drain <=3%. You can find your model in General->About->Model, and use the information in this excellent TechWalls article to understand the differences between models and to figure out which model you own. iPhone 6 model A1586: baseline daily drain is 3-8%. This phone had higher drain than any of the other iPhone-sixes that were tested. Laurie ran 29 different overnight tests on her phone, using a wide variety of configurations (in signal range or not, with ATT or Verizon or no SIM, on the counter or in motion in a pocket), and the ten-hour drain was usually 2-3%, ranging from 1 and 4%, with no discernable pattern. It remains a mystery why this unlocked model in all its configurations had more battery drain than the other models of sixes that were tested. Perhaps it is something in this particular model, or perhaps it is this one particular phone. ATT or Verizon iPhone 4S 5 or 5S or 5C: baseline daily drain is 2-6%. 1-2% per day: SIM Inactive (either locked or removed) (signal either present or absent). 9-10% per day: SIM Active (signal present). 30% per day: SIM Active (no signal). Use the SIM PIN feature (read Apple’s Help Topic. and call 611 from your phone to get your initial PIN from ATT). When using this feature, you are asked for the PIN code only after the phone is fully powered down, not after each time the phone has been asleep. This is an elegant easy-to-use solution that gives a great result. Special Note about using the SIM lock feature in ATT iPhones 5 and 6: In the ATT iPhone 5 and 6, the SIM lock feature has a substantial bug. Unlike the iPhone 4 (where it solves a problem) it is counterproductive in the newer phones, which have more drain with a locked SIM than an unlocked SIM. Fortunately the newer phones don’t need this feature since they can simply set Airplane Mode = ON. When the SIM is locked, Airplane Mode = OFF, and there is no signal available, the phone will drain 2-10% per hour !!!! To maximize battery life of an ATT iPhone 5 or 6, don’t lock or remove the SIM, as that will cause a disaster when you leave signal range. Update to iOS8.3 and set Airplane Mode = ON and all will be well. We have not seen this problem reported for Verizon phones, so users with Verizon phones can lock or remove the SIM if desired.